China has finally permitted the import of Indian basmati into its markets in a move that is expected to marginally reduce the yawning bilateral trade imbalance in China�s favour. Officials said a notification in this regard was issued by the Chinese authorities to traders earlier this week. Islamabad: Pakistan will soon issue tenders for the import of 500 MW of electricity from India after the proposal is aproved by the Federal Cabinet. Maoists today demanded the release of eight of their jailed leaders in Chhattisgarh and a halt to Operation Green Hunt in exchange for the freedom of Sukma Collector Alex Paul Menon, who was safe, a day after he was abducted. They also set an April 25 deadline for fulfilling their demands. The European Union (EU) has offered India to join hands with it on defence and security related issues in a bid to widen the spectrum of its allies. The long-term goal, as per the EU, is to jointly tackle the situation in Afghanistan and the emerging problematic countries in Africa besides combining efforts on counter terrorism, cyber security, crisis management and counter piracy efforts in the Indian Ocean. AP houses one of world�s largest uranium reserves! The arid and backward Rayalaseema region of Andhra Pradesh may well be sitting over one of the world�s largest uranium reserves. The uranium reserves in and around Tummalapalle village in Kadapa district were initially estimated at 15,000 tonne, but continuous exploration has shown promise of further reserves. 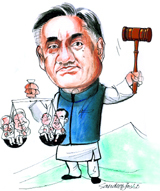 As if climbing up to the seat of Chief Minister of the hill state of Uttarakhand was not treacherous enough, Vijay Bahuguna discovered establishing his right on the peak was even more so. But the 65-year-old judge-turned-politician has put all his years of experience in discretion and persuasion � not to mention a formidable family name in politics � to good use in subduing all resistance.